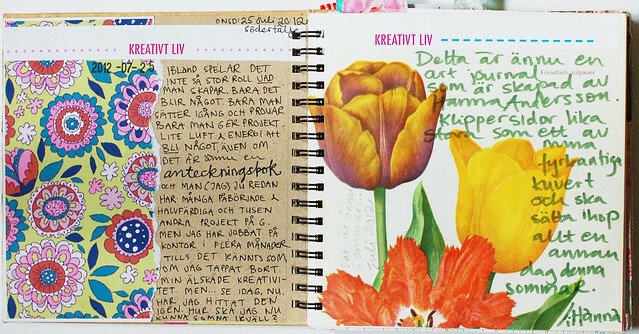 One way to do this is to open up your Art Journal tonight (any notebook will do), select a few pens (or a glue stick!) and put them on a clean table. Let the blank page see some light and air. Then, tomorrow when you wake up and see the open book, it will draw you in and ask you to do a few marks on the blank page. In this simple way, you will have started. What is it you have started? The road to more creativity in your life. Rinse and repeat! This entry was posted in Art journaling and tagged smart journal, starting a project. Bookmark the permalink. This is such a good idea. It can be real work to clean a space and look for art supplies. But giving the project some room is a wonderful idea! And I love your journal page, too. Those pages are bright and cheery! You find some of the best papers and images–always so colorful. What kind of resources do you use? I have collected images for many years, but most of them I found as cheap as possible, from old books, second hand magazines that others have finished, prints from the internet… I hardly ever buy any images. Will post some collage kits in my etsy shop next week, there might be something you will like. WHAT a great idea. Of course. First, I guess, I’ll have to make a space on the cluttered table. HA! Yes! I love that we think alike! I love to have something open and in process on the table, supplies ready to go, and then later that day or the next day I can just jump right into the artsy action.